Robert Lopez and Kristen Anderson-Lopez are the people who wrote the hit “Let it Go” song popularized by Demi Lovato that eventually became a soundtrack of Disney’s 2013 film “Frozen.” In the movie alone, the song already became popular but without single release. The thing is the song won the Academy Award for Best Original Song at the 86th Academy Awards performed by Idina Menzel who also played the role as Queen Elsa in the movie. Looking at this detail, we can say that the song was really wonderfully written. Because of the need to give the song a framework to be released as a single in the industry, Demi Lovato recorded her own version of the song "Let it Go". Demi was personally chosen by the writers to record the song and release at as a single for a lot of reasons and one of them is that she is a former Disney talent. 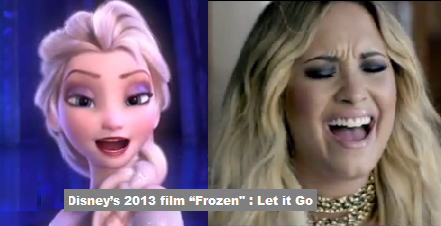 It was October 21, 2013 when Demi’s song "Let it Go" version was released. A video then followed wherein clips from the movie were included. Here is the original video clip "Let it Go" from the movie Frozen. What’s amazing in the music video is that Demi really portrayed her role as the singer well. Wearing black and blonde hair highlighted her more on the video. It was released on November 1, 2013 that really became popular and watched by millions of people in youtube, 122 million views to be exact. The music video was directed by Declan Whitebloom. Here is the official Demi Lovato recorded own version of the song "Let it Go". Nowadays, the song is a wide hit that really conquered the radio and music stations. The popularity of the song reached so many countries like Australia, France, Denmark, South Korea, Sweden, etc. that made it to the chart. Another amazing thing this is that the movie “Frozen” alone was dubbed into 42 other languages worldwide that made it possible to reach out to people of different lingua francas.